As an avid New York Yankees fan, I've come to appreciate the late Yogi Berra's famed "Yogiisms". One of my favorites is the classic line, "You can observe a lot by watching." Over the past few weeks, I've both watched and listened (via the CNBC simulcast on Sirius) to a variety of CNBC's financial programming. 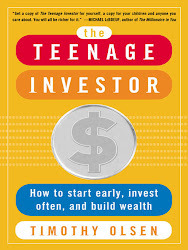 In my 2003 book, The Teenage Investor, I was very critical of the financial media and how predisposed they are to hyperbole in an effort to drum up interest and ratings. While I am still very critical of listening to the financial media with any frequency, I began to notice some value in paying attention to the media more - even if it only serves as a reminder of what to ignore on your investing journey. Case in point: much has been made of the demise of the brick and mortar retailer in the age of Amazon. In June, Moody's put out a report highlighting financially distressed retailers. Among the names were well-known retailers like Sears, Neiman Marcus, Gymboree, and Nine West. Retail stocks have suffered over the past few years as brick and mortar retailers attempt to figure out how to compete with Amazon.com and other trailblazing online retailers. Over the past few months, financial commentators have speculated on which retailer would be the next to file for bankruptcy or otherwise exhibit signs of financial distress. Many of the most well-known retailers who are not yet considered financially distressed have seen steep stock price declines, and financial commentators have also begun to wonder whether the American mall will exist in a few years. So why am I bringing this up? There is no doubt that Amazon is a force to be reckoned with, not only in retail but in various other areas. However, the same financial press who has declared the death of retail, today questioned whether they had gone too far in that assessment. How did this happen? Amazon.com reported Q2 earnings on Thursday that were weaker than expected, and the stock lost roughly $10 billion in market value. The financial press then began discussing whether their predictions for the "death of retail" were wrong, and if an inflection point had been reached where brick and mortar retailers could happily co-exist with Amazon...all because of a singular weak quarterly earnings report. I have no thoughts or opinions on the viability of purchasing retail stocks, Amazon stock, or any other individual stock in light of all of this information; that's simply not an area I play in. However, by watching CNBC and other financial media outlets over the past few weeks, my view that it's dangerous to get wrapped up in headlines and financial commentary was reaffirmed. More importantly, I also came to the realization that there is a lot of value in paying occasional attention to the financial media, if only to have it serve as a reminder that everyone has an opinion and a position on any given hot button issue. The only opinions that truly matter in the financial world, however, are from the investors who put their money on the line in support of it - and that's what ultimately moves markets. It's Time for Some Inaction! Like most people, I'm finding it very hard to distance myself from the grim news that has dominated the financial headlines over the past few months. Everyday seems to bring another story of a European bank or country on the brink of failure, the U.S federal government's fiscal issues leading the country to the verge of financial meltdown and more and more bad news on the economic front. It's safe to say that all of this is leading to heartburn for many investors, particularly those who are most exposed to equity markets and have thus received the brunt of the market's move to the downside. We will thus hear the requisite talking heads on CNBC and other financial news networks extolling the virtues of "buying aggressively" or from the opposite end of the spectrum "moving assets into cash, Treasuries, precious metals and other safe havens". My advice to you is relatively simple and may seem to go against the grain but it's battle tested and makes sense: simply stay the course, continue with your investment plan and let the market work its issues out. As soon as we become reactionary and allow market movements severely dictate how we invest in the here and now, we have let our emotions get the best of us. This is not to say that we shouldn't put some more funds to work since stock prices are low - in that case, it may make sense to buy some more shares of your index funds to better dollar cost average - but avoid any actions that run contrary to what your investment plan is. If, for example, you contribute 10% of your pre-tax pay to your 401(k), it may make sense to up that percentage to 15% or so if you can afford to do that. However, slashing that rate to 0 or upping it to 30% simply doesn't make much sense. Believe me, that type of reaction to current market gyrations occurs a lot more frequently than you realize! As the legendary John Bogle noted, "Don't do something. Just stand there."